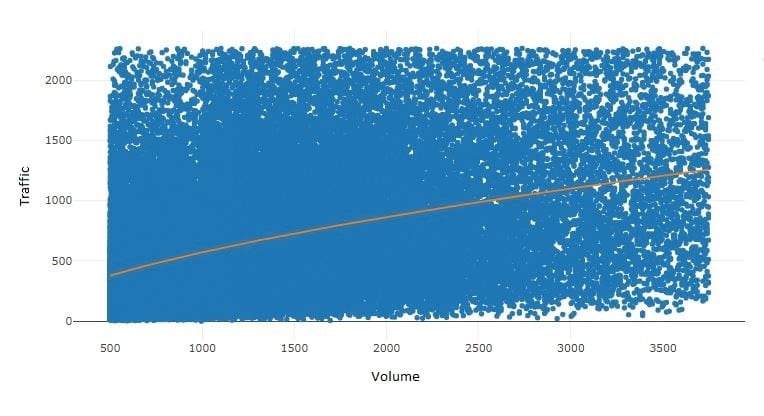 The practical application of the keyword search volume metric is quite obvious. We use it to determine how much organic search traffic our page will get if it ranks on the front page of Google for a given keyword. 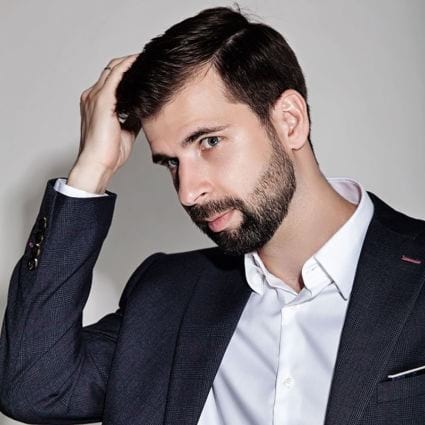 The logic is very straightforward: the more people that search for a specific keyword in Google, the more traffic the top‐ranking pages for that keyword will get. And if the search query doesn’t get a lot of searches, then the traffic to the top ranking pages would also be low, right? I’m sure every professional SEO has noticed that ranking a page for a high‐volume keyword doesn’t always result in a huge amount of traffic. And the opposite is true, too—pages that rank for seemingly “unpopular” keywords can often exceed our traffic expectations. Here at Ahrefs we have enough data to study this phenomenon at scale. Because of the nature of the experiment, the search queries weren’t picked at random. Scroll to the bottom of this article to learn the details. Obviously, the search volume of a keyword and the total search traffic to the top‐ranking page are rather well correlated. But, at the same time, there are many cases where pages that rank for high‐volume keywords don’t get a lot of traffic, as well as the other way around. I see a lot of people using the phrase “accurate search volume” and even looking for a tool with “the most accurate” one. There’s no consistency in regards to the search volume…even between Google’s own tools. Between Google Keyword Planner, GKP “Forecaster” & Google Search Console “Impressions”, all of them show different numbers for the same keywords. In other words, the search volume number that you see in Google AdWords is quite different from the actual number of searches that are going to happen next month. Which means that a traffic prediction based solely on the search volume alone cannot be accurate. Back in the days of “ten blue links”, searchers couldn’t get an answer to their search query, unless they clicked on one of the links in the search results. Google has a goal of providing the best possible user experience for searchers, which implies answering their question right away. Hence the variety of “SERP features” that display information right in the search results, so that people won’t need to click through to any websites. Well, in Google Adwords they don’t show you that. You only get the raw search volume of a keyword and you don’t know if searchers are actually clicking on the search results or not. But here at Ahrefs, we don’t rely on Google Adwords data alone. We pair their search volume numbers with the data that we get from clickstream. This allows us to see if people are actually clicking on any of the search results, after performing a search. According to our data, only 19% of searches result in clicks on the search results. And that “instant answer” on top of the search results (see my screenshot above) is the reason why people don’t click. Luckily, that doesn’t happen with all search queries, because the vast majority of them cannot be answered this briefly. So there’s still a massive amount of search traffic that Google has to send to the actual websites. But lately, Google seems to be showing the “people also ask” box for an increasing number of search queries—many of which are quite “uncommon”. This makes it harder and harder for regular search results to get clicks. You can see that the “people also ask” box has started occurring for many of these terms over the past few months. Technically, Google is not stealing clicks from you. They just make it so people don’t click anything at all, because they get the answer right away. The ones who are actually stealing your clicks (almost literally) are advertisers. There used to be three ads above the organic search results, now there are four. The ads used to clearly stand out from the natural search results, so that searches could make a conscious decision as to whether they wanted to click on an Ad or a natural result. Now the Ads are almost indistinguishable from natural search results. AdWords will not only show your ad for the search queries that you choose to advertise for, but it can also display your Ad on all sorts of closely related searches. I created a great guide to keyword research, which consistently ranks #3 for “keyword research.” But it doesn’t get as many clicks as it deserves, because of the Ads. And Google doesn’t shy away from advertising their own stuff in the search results. What kind of Ad budget would allow you to compete with a multi‐billion company, that also happens to own that Advertising platform? And that is not some kind of rare case. If the keywords that you’re targeting have even the slightest commercial value, you can expect to see Ads. These will push organic results down, which makes people less likely to notice them. When doing keyword research, a lot of people tend to forget that there might be a ton of related searches to a query that they choose to pursue. Back to our example of “who founded google” search query. Google is smart enough to understand that the meaning behind all these search queries is exactly the same. Which is why it shows nearly the same search results for all of them. As you can see on the screenshot above, this page is ranking for 517 different search queries in the US alone. Each of these keywords might be bringing only a tiny bit of traffic, but it eventually adds up to a fairly decent number. Another thing you might notice is that some of these search queries aren’t even closely related to the original one (i.e. “who founded google”). I’m talking about queries like “when did Google start” or “google company history”. Turns out that an average #1 ranking page will also rank for about a thousand relevant search queries. And even if your page doesn’t rank in top5 for your main (most popular) search query, you may still get decent search traffic, because it may very well rank in top5 for a few hundred secondary (less popular) queries. The backlinks — This is still one of the strongest signals for Google that your page deserves to rank. If you’re frequently using Ahrefs’ SERP Checker feature, you might have already noticed that pages with more backlinks tend to rank for more keywords and generate more search traffic in total. Let me expand a little bit on the first two. 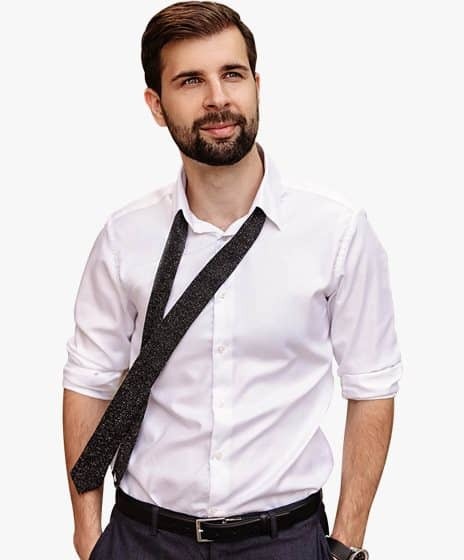 In the prequel to this post, I used a cool example to illustrate how a seemingly more popular topic can have a profoundly smaller total search traffic potential. Which of these two topics do you think has a bigger search traffic potential? The one with more search volume, right? Nope, it’s the other one. It turns out that the topic that is roughly half as popular (according to it’s search volume) actually sends 10x more traffic in total. The “SEO tips” page only ranks in Google for 148 search queries, while the “submit your website to search engines” page ranks for almost 4k search queries. I’m sure that a lot of people who are reading this article right now are on the verge of stuffing their content with all possible variations of their main search query, with the aim of getting more search traffic. I mean, how can you rank in Google for things that you don’t mention on your page, right? Well… turns out you can. Last year we studied 2 Million random search queries to see how different on‐page factors correlate with ranking position. One of such factors was the presence of the exact‐match search query anywhere on the page. 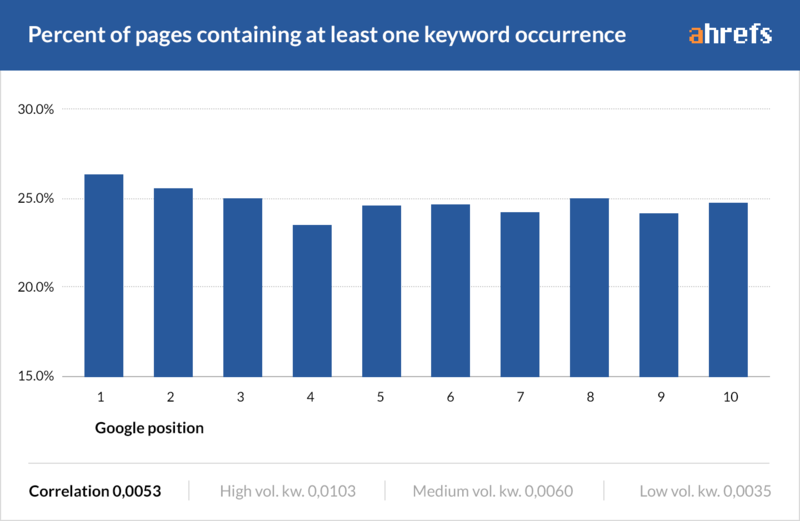 According to our data, almost 75% of pages that rank in top10 for a given keyword don’t have even a single mention of that exact‐match keyword anywhere on the page. In other words, you don’t need to turn your content into a barely readable collection of all possible search queries around a certain topic. That might have worked in 2005, but not in 2018. Study the top ranking pages and the keywords they rank for. This will help you to understand how deep you can go with covering that topic and which search queries you can hope to attract with your page. I just told you about our “also rank for” study, where we determined that the average top‐ranking page will also rank for nearly 1000 more relevant search queries. All because people ask the same question in all sorts of peculiar ways. Well, that study was based on Ahrefs’ “database of search queries”. Which is (most likely) the biggest in the industry, but not nearly as big as the actual number of searches people put into Google. And in 8 months since that study was published, our US keyword database grew to 1.98 Billion search queries. That’s a +41% improvement. You may also notice that over 90% of the keywords in our database have less than 20 searches per month—these are called the long tail keywords. So the “fat head” of our keyword universe doesn’t change much, but the “long tail” keeps getting longer. It is estimated that Google is serving ~5.5 billion searches per day. And 16 to 20% of search queries that get asked every day have never been asked before. This means, that Google’s “keyword database” adds nearly 33 Billion “never been asked before” search queries every single month. For any commercial SEO tool (like Ahrefs), the costs of running such a monstrous keyword database can’t really be justified. Not to mention that there’s no way for any third parties to “catch” 100% of search queries that people put into Google every day. We simply don’t know all the possible search queries that a page may rank for. Especially when nearly 20% of search queries that people search every month “have never been asked before”. And that is why you should not shy away from targeting the low volume (low traffic) keywords—you never know what is the total search demand behind them. 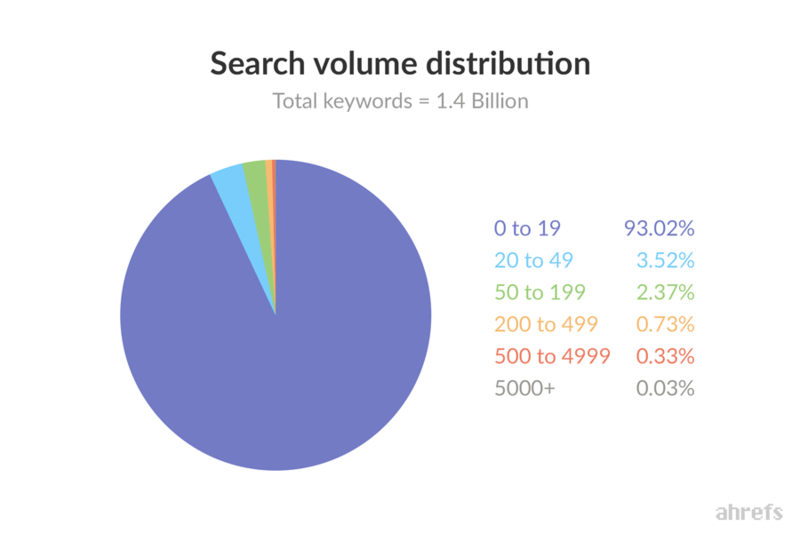 We took ~3.7 Million keywords with search volumes ranging from 500 to 5000 searches per month. For each of these keywords we pulled the #1 ranking URL from Google. 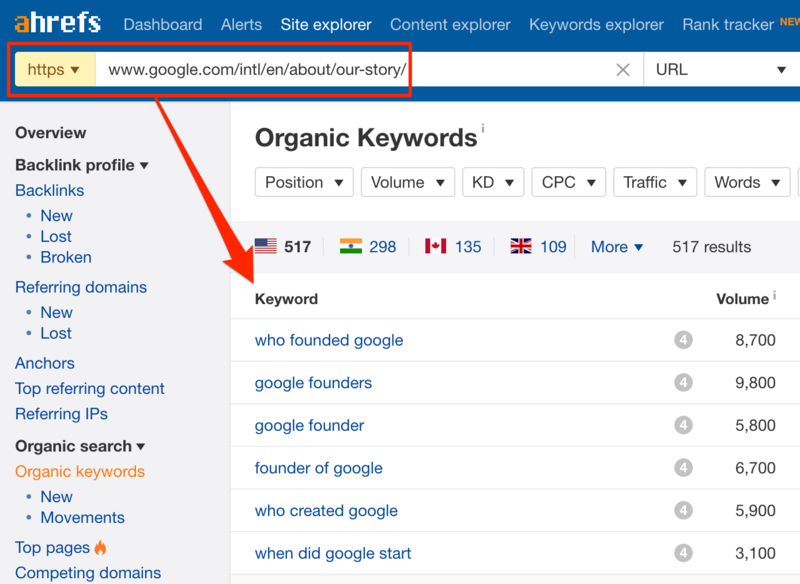 We identified the keyword that is sending the most search traffic to that page (in Ahrefs’ interface we call it “top keyword”). We plotted all these “top keywords” on the graph, with their monthly search volume being X and total search traffic to a page being Y. And, finally, we removed the outliers to “zoom in” on that graph. We ended up with 72,492 “top keywords” and a correlation of ~0.4541 between the search volume of a keyword and the total search traffic coming to the #1 ranking page. As you can tell, those are mainly definition‐type keywords, where Google can display an instant answer in a Knowledge card. These ones are mostly examples of “broad topics,” where people don’t have a single common way to ask this question to Google. On one hand, you might get blinded by the high popularity of a keyword and overlook the fact that it doesn’t get any clicks. On the other hand, you can discard hundreds of “unpopular” keywords, while the total search traffic potential was actually quite decent. We had to crunch a ton of data to come up with the numbers and insights that would persuade you to look beyond the raw search volume metric. And we’re hoping that this new knowledge will help you refine your keyword research and get better ROI out of your SEO efforts.